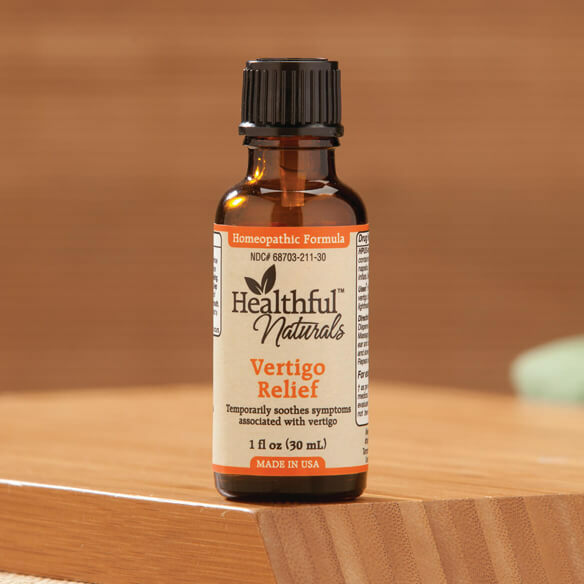 Feel grounded and like yourself again with Homeopathic Healthful™ Naturals Vertigo Relief. This topical homeopathic remedy helps treat the distressing symptoms of vertigo, including dizziness, lightheadedness and nausea. As its homeopathic active ingredients help to restore balance, its aromatherapy properties help you stay calm and relaxed. Simple to use — massage a small amount into the tragus, the triangular cartilage on the outer ear, as well as the outer nostrils while inhaling deeply and slowly. Homeopathic vertigo remedy helps restore balance and calm. Active ingredients: aconitum napellus, cocculus indicus, lobelia inflata, salicylic acidum, tabacum. Grapeseed and essential oil base provides aromatherapy benefits. Use at first sign of vertigo and repeat as needed. Combine with a healthy diet and sufficient hydration for best results. 30 ml of topical oil is approx. a 30-day supply. cuz grampa suffers from vertigo & has tried everything for relief to no avail! Fingers crossed this will give him some relief! want to try it and hope it works. My sister said that it might help me. I have a condition called "Begnign paroxysmal vertigo that nobody seems to help beside surgery. Hopefully , I will get relief when needed. I sometimes experience dizziness when walking. To try to see if it will help my dizziness. My child has Vertigo, and we wanted to see if it would work. There is almost no available treatment for dizziness that has no diagnosed cause. I'm hoping this will take care of the problem. I am being attacked by dizziness and nausea. I tried the VertiFree and it worked but I want to try the Natural Relief Vertigo. Does this really work the Natural Relief Vertigo? BEST ANSWER: This product did not work for me. The Healthful Naturals Dizzifree (oral spray) worked much better. My dizziness was caused by using multivitamins (and bread/cereal products) that contain way too much synthetic folic acid. I cannot use anywhere near the RDA of 400 mcg. My limit is closer to 200 and really needs to be real folate from food. I bought this for my Mom and she has found it helps. I would imagine relief depends on why you are experiencing vertigo but it has proven to be worth the try. Hello, I'am sure it works very well for some, just not me! Gave to friend an it seems to help her! Does this Vertigo Relief really works? BEST ANSWER: Thank you for your question. Yes the vertigo relief works really well. We hope this information will be of help to you. Results from users of Vertigo Relief Product?